Jeffrey L. Collins, age 56, of Sullivan, Missouri, passed away on Wednesday, February 6, 2019 at Missouri Baptist Hospital in Sullivan. Jeffrey Laine was born on April 17, 1962 in St. Louis, Missouri, to Jay and Norma Collins. He grew up and attended school in St. Louis and was in the 1980 graduating class of John F. Kennedy high school in Ballwin, MO. During his youth, Jeff enjoyed traveling and doing different types of work, which included, cable line installation, land surveying, and quality control inspecting. He even helped survey for the runway addition at Lambert Airport in St. Louis. Jeff enjoyed being a drummer and was even in a band for some time. As a young man, he met his love, Mary Hencinski, and they were blessed with a son, Alex. 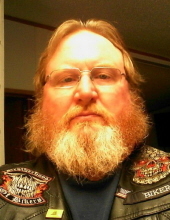 Jeff loved motorcycles and was a member of the Patriot Guard Riders. He also enjoyed computer games, watching NETFLIX, camping, trout fishing, and four wheeling. He will be lovingly remembered and missed by his family and friends. Jeff is survived by three sons, Alex Collins of Sullivan, MO, Alan L. Johnson and wife, Heather, of Pennsylvania, and Andrew Johnson of Sullivan, MO; his parents, Jay L. and Norma J. (Bullock) Collins of Sullivan, MO; three uncles, Dwight Collins and wife, Joy, of Jonesburg, MO, Norman Bullock and wife, Donna, of Salem, MO, and Roy Bullock and wife, Joyce, of Dayton, TX; one aunt, Ramona Harris of Maryland Heights, MO; special cousin, Patty Kline and husband, Steve, of California; his little buddy, Rico; numerous other cousins and relatives. He was preceded in death by the love of his life, Mary Johnson; his grandparents; three uncles, Darrell Bullock, Al Collins, and Winn Collins. Visitation will be held from 10:00 AM to 12:00 Noon, Saturday, February 9, 2019 at the Eaton Funeral Home in Sullivan. Funeral Services will then be conducted at 12:00 Noon, on Saturday, at the Eaton Funeral Home, with Pastor Chester Lahmann officiating. Cremation to follow. Friends may send online condolences to the family of Mr. Collins at www.eatonfuneralhome.com. To send flowers or a remembrance gift to the family of Jeffrey L. Collins, please visit our Tribute Store. "Email Address" would like to share the life celebration of Jeffrey L. Collins. Click on the "link" to go to share a favorite memory or leave a condolence message for the family.